1 of 4 In a measuring cup, whisk broth, teriyaki, vinegar, cornstarch, sugar and red pepper flakes. Set aside. 2 of 4 Bring a large pot of water to boiling. Heat the canola and the sesame oils in a large nonstick skillet over medium-high heat. Add chicken and cook 4 minutes, stirring occasionally. Remove to a plate. Add mushrooms and cook 2 minutes. 3 of 4 Meanwhile, add soba noodles to boiling water and cook, 3 to 4 minutes. Drain. 4 of 4 Add bok choy and red pepper strips to skillet. Cook 2 minutes. Return chicken to pan along with broth mixture. Cook 2 to 3 minutes, until thickened. 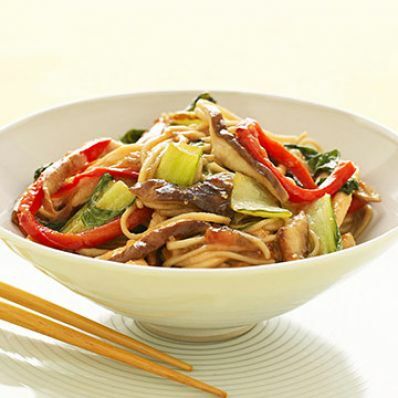 Gently stir in soba noodles and serve. Per Serving: 1 g sat. fat, 2 g fiber, 45 g carb., 26 g pro., 44 mg chol., 5 g Fat, total, 805 mg sodium, 325 kcal cal.